Versatile - use in soups, pastas, dips, etc. Keeping my Western dishes authentic is a challenge because of my staff's varying skill levels. 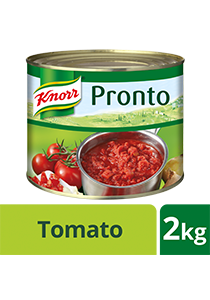 Knorr Pronto Italian Tomato Sauce consistently delivers great taste because it is made from real Italian tomatoes. Brings the fresh full flavour of the choicest Italian plum tomatoes right into your kitchen. Ready to use as it is or as a base for other sauces. Simply add desired amount to soups, sauces or dishes. Before opening - store in a cool and dry place. Prevent temperature fluctuations.